— now available as podcasts through Apple iTunes! You now can access introductory discourses by Adi Da Samraj on Apple iTunes, as free podcast episodes (both audio and video). These presentations cover a wide range of subjects, including "Who is Adi Da? ", "What is Adidam? ", and other frequently asked questions. There are two podcast series available — The "Radical" Truth audio podcasts and The "Radical" Truth Video Series. Both the audio and video episodes are especially selected for those who may not yet have heard or read about Adi Da Samraj. Podcasts are essentially audio or video files delivered to your computer. What is unique about this medium is that you can subscribe to a podcast series as you would subscribe to a magazine. The content is then automatically delivered to you for free, whenever new podcast episodes become available. Many people appreciate that this process happens without adding any extra messages to your email account's inbox. By subscribing to a podcast, you have the option of having it automatically downloaded onto your computer for listening whenever you wish. Once these podcasts are on your computer, they can also be downloaded to your iPod or even your iPhone! Do I need special software to listen and subscribe? Yes, but it's free and very simple to download and install. Simply click on this link to the download page on Apple's website. There you will find software for both PC and Apple computers. Download and install the appropriate software for you. It takes a bit of time, but it is completely virus and spyware free. How do I find the Adidam podcast pages? You will first need to install the iTunes software to your computer, as explained above. Then click on the links below. This will automatically open the iTunes program and take you to The "Radical" Truth podcast pages. Be patient. It may take a minute or two. You can subscribe by simply clicking on the "Subscribe" button to the right of Adi Da's Picture [see #1 on the iTunes sample page]. This will subscribe you to the podcast series and will automatically download new episodes when you open to iTunes. 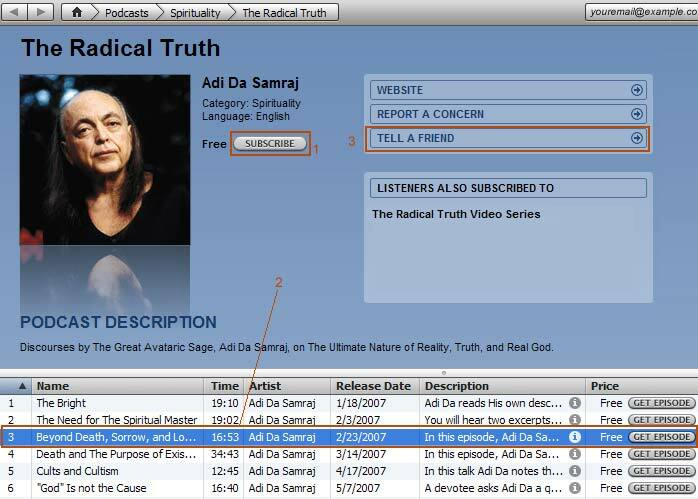 Please note that there are two series of The "Radical" Truth podcasts: an audio podcast and a video podcast. You will need to subscribe to both series if you want them both. How do I listen to the previous podcasts? Simply click on the picture of Adi Da Samraj (in either the audio or the video series) and this will open up the page where all current podcasts in that series are located. The various podcasts are in the bottom half of the page. [see #2 on the iTunes sample page]. Double click on the episode you want to listen to and that episode will play. How can I share podcasts with friends and relatives? When you're on the page where the podcast episodes are listed (either the audio or video series) go up to the top right hand of the page. There you will see a line that says "Tell a Friend." Click on those words [see #3 on the iTunes sample page]. A new window will automatically open. This will show a picture of Adi Da Samraj, a place to type in the email of the friend you want to send it to, your email address, and even a place where you can type a personal message. After filling in the information, click "Send". By sending this information via email, you can allow your friends and family members to get direct access to the Adidam podcast page. So that's all there is to it. Remember that you can also sync these podcasts with your iPod or iPhone, for easy access as you travel. We are hoping to make available at least one new podcast a month. We hope to increase that to twice a month soon. Finally, we would like to encourage you and your friends to subscribe to these podcasts. Your subscription and those of your friends will help to make Adi Da Samraj's wisdom available to many more people by encouraging iTunes to feature these podcasts more prominently. If you have any comments or suggestions, or if you need technical help, please write to us. To give you a fuller sense of the content that these podcasts offer, here are two sample episodes.